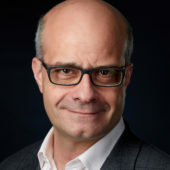 Citation: Chappel E, Dumont-Fillon D, Piveteau L-D, “Low-Cost Disposable Wearable Injector Platform for Large Volumes of Viscous Drugs”. ONdrugDelivery Magazine, Issue 95 (Feb 2019), pp 68-72. There is a wide variety of device types available for injectable drugs. Pen injectors, jet injectors and others, including piston syringes or mechanically operated injectors, are designed to inject single or multiple doses of drug, contained in a cartridge or reservoir, via an automatically or manually inserted needle, or through a high-velocity jet. Depending on the application (acute intervention, prevention or long-term treatment) the intended user can be a healthcare professional, a caregiver or the patient themselves. Injectors can be generic or dedicated to a single class or family of drugs. The injection routes targeted include subcutaneous (SC), intradermal, intramuscular and intravenous. The development of a wearable injector could also be driven by product lifecycle management considerations, a trend initiated by Amgen (Thousand Oaks, CA, US) and its product Neulasta® (pegfilgrastim). This drug stimulates the bone marrow to produce more white blood cells (neutrophils) in order to decrease the incidence of infection after chemotherapy. Since 2015, Neulasta has been combined with the Onpro® kit, a wearable injector which is an interesting solution not only to improve patient convenience, but also to stave off biosimilar competition. Many bolus injectors, such as Amgen’s Pushtronex® and Onpro®, comprise a complex engine that moves a plunger inside a cylindrical barrel containing the drug, with the reservoir being either prefilled or filled by the user. In addition to the cost associated with the motor and its assembly, such technology limits the size ratio between the drug reservoir volume and the device volume, the maximum plunger displacement being limited to about half of the device length. A fully disposable wearable injector platform should ideally utilise a low-cost, reliable engine to be compatible with reimbursement policies. It should be able to deliver a large range of viscous fluids in volumes from 1 to 10 mL. Finally, it should be reliable and exhibit a low dead volume as many biologics are expensive. The device structure should be cost efficient by design. 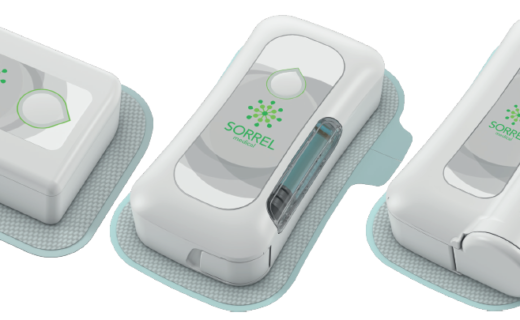 The device shall be compatible with the state-of-the-art cannula available on the market. 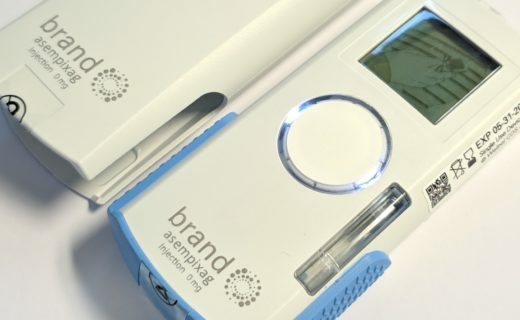 The standard version of the device shall contain no battery, no electronics and no software to speed up time-to-market and to alleviate both regulatory requirements and patient hazards. The cannula patch and its automatic inserter. Figure 1: Wearable injector and its needle protection. The device and the cannula are provided in the same package. The cannula patch is first affixed to the patient skin using the automatic inserter that retracts the inserter needle to prevent user injury after positioning. 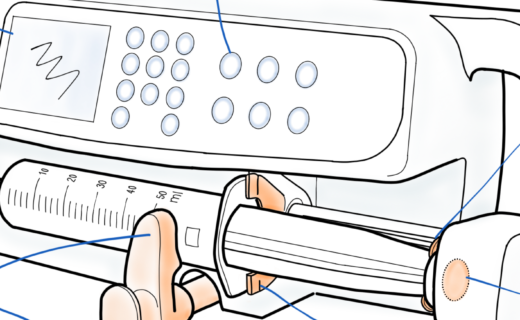 The user can then fill the drug reservoir with a syringe and verify that filling is complete by checking a visual indicator. The protective cap on the device’s needle (Figure 1) is then removed and the user can slide the device onto the cannula patch, where it is permanently affixed, making the device ready to use. The infusion is started by pressing the activation button and can be monitored using a mechanical infusion status indicator, where the presence of an element visible through a window indicates that the full dose has been administered. Once the infusion is complete, the user can remove and discard the patch and device. The device contains a semi-flexible drug reservoir that is initially collapsed against the rigid part, and user-filled with a syringe. This action inflates the reservoir membrane, which is thermoformed to prevent the generation of pressure onto the drug as filling is completed. The cavity surrounding the reservoir membrane is initially closed by a plug that covers the reservoir vent and the needle. During filling, a positive pressure generated inside this cavity will move a low-friction plug inside a transparent cylinder, equilibrating the pressure inside the container. The filling gauge, which is located on the bottom of the device, is only visible during the filling process. As shown in Figure 2, the fill volume is indicated by the position of a plug. Figure 2: Back-side of the bolus injector showing the filling gauge before filling (left), just after filling of 5 mL (centre) and after the needle cap removal (right). The injection is driven by a liquefied gas reservoir that is opened by the user after placement onto the patch. The vapourisation of the liquefied gas generates a large pressure differential that will push an elastomeric membrane against the flexible part of the drug reservoir. The cavity between the two membranes is vented to prevent any risk of infusion of propellant into the patient. The pressure acting on the fluid is equal to the vapour pressure of the propellant since both membranes are flexible. At the bottom of the drug reservoir, a small cavity is used to connect an infusion status indicator, and the fluidic restriction used to limit the flow rate to a maximum of 1.5 mL/min. The status indicator is a transparent cylinder that contains one drilled plug and another solid one in contact with the drug. The pressure generated during infusion first moves both plugs towards the dead-end of the cylinder until pressure equilibration. When the full dose has been administered, the reservoir membrane can no longer transmit the propellant pressure to the fluid and therefore the solid plug comes back to its initial position, infusing the residual amount of drug that was located inside the indicator cylinder. The dead volume of the device is thus limited to a few tens of microlitres. Figure 3 shows a first illustrative version of this indicator as seen on the top shell of the device. Usability studies are on-going to refine the indicator and to make sure that the user interprets it correctly. Figure 3: Infusion status indicator before activation (left), during infusion (centre) and after infusion (right). Three dots: End of injection. The “end of injection” indication is only visible when the reservoir membrane is fully collapsed against the bottom of the reservoir shell. It is not visible in case of cannula occlusion. For a specific medication volume and viscosity, maximum infusion duration will be indicated in the user manual, therefore the user can deduce that the full volume has not been administered (in case of total occlusion for instance) if the infusion status indicator is still showing “injection on-going” after this maximum duration. The high pressure generated by the propellant vapour will limit the occurrence of an occlusion in the cannula. A common issue in insulin delivery is associated with a failure of the infusion set, due to issues such as cannula occlusion, cannula dislodging and leakage, amongst others.6 The use of the cannula patch is a key asset to secure the connection to the patient. Other products developed by Debiotech share the same philosophy: after the placement of the cannula, the user is able to check visually, via a transparent window, that the cannula has been properly inserted into the skin. Because a single dose of a biologic medication can cost up to thousands of dollars, it is highly undesirable to discard an injector filled with the drug solely based on a cannula failure. The user is therefore provided with an independent cannula that could be used to replace the defective one, thereby saving wasting the drug and limiting the cost to only a few dollars. Tests to confirm the volume accuracy were performed at 20°C using a mix of water and glycerol. The nominal volume of the reservoir is 5 mL. Volume accuracy was first estimated considering fill volumes of 1, 2, 3, 4 and 5 mL respectively (±2%), and fluid viscosities of 5 and 25 cP. A mean dead volume of 32±6 μL was measured, which was independent of the fill volume and the fluid viscosity. 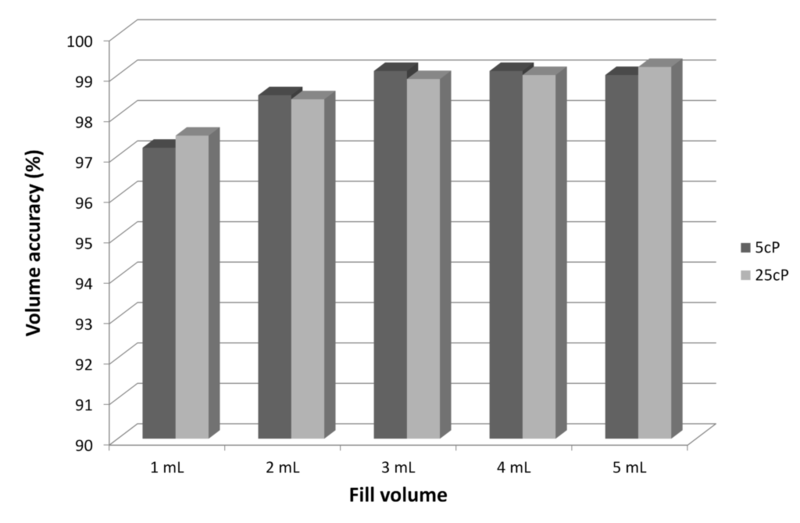 Figure 4 shows the volume accuracy as a function of the fill volume. Considering all the data, the mean accuracy is better than 98%. Figure 4: Mean volume accuracy at 5 and 25 cP, for fill volumes of 1, 2, 3, 4 and 5 mL. A specific test was carried out to measure, for a given fill volume of 3 mL, the effect of viscosity on volume accuracy considering fluids of 5, 10, 25, 50 and 100 cP. The results are shown in Table 1. Volume accuracy was again shown to be above 98%, independent of the fluid viscosity. 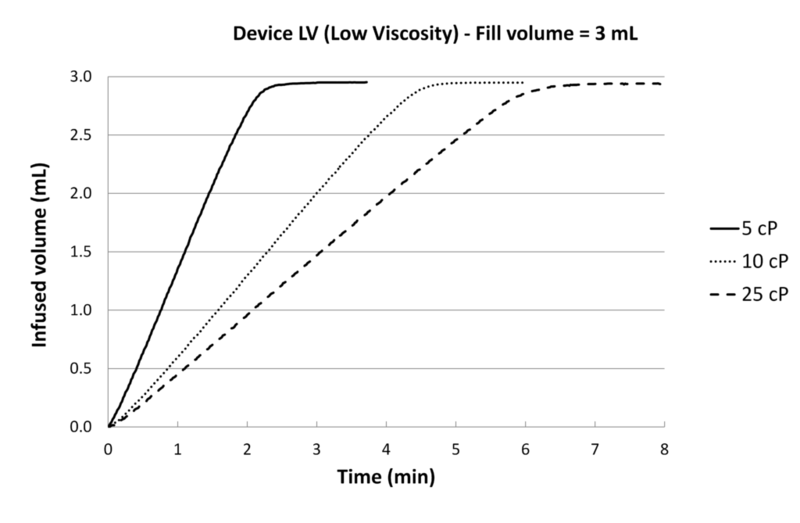 Table 1: Volume accuracy as a function of medication viscosity for a fill volume of 3 mL. Two versions of the bolus injector designed for infusion of volumes up to 5mL were tested: the low viscosity (LV) version is dedicated to fluid viscosity up to 25 cP while the high viscosity (HV) version is adapted to viscous fluids up to 100 cP and above. The LV version is intended to deliver a minimum flow rate of 0.5 mL/min at 25cP, and the HV version at 100 cP respectively. The fill volume was fixed at 3 mL. The LV version was tested using fluids of 5, 10 and 25 cP respectively. Viscous fluids of 25 and 100 cP were used to characterise the HV device. The measured flow rate profiles are provided in Figures 5 and 6. The linear slope indicates that the flow rate is constant throughout the infusion duration, as the propellant vapour maintains a constant pressure on the elastomeric membrane, which is fully transmitted to the fluid via the elastomeric and reservoir membranes. 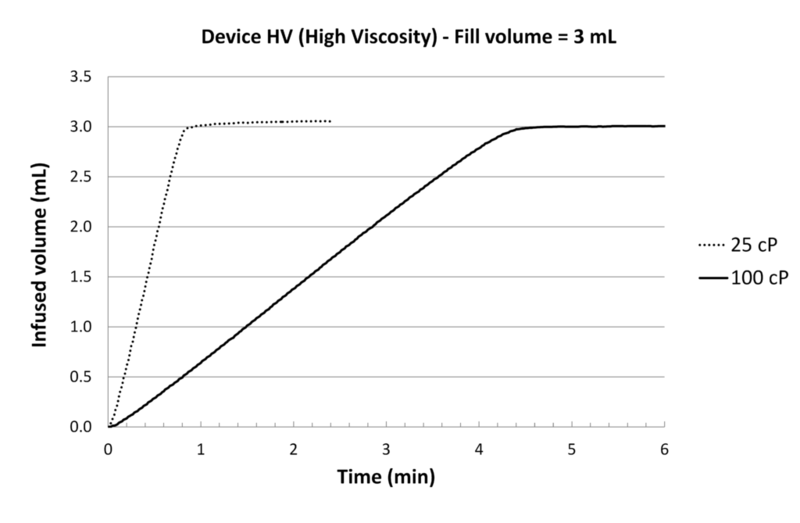 Figure 6: Infusion profiles of high viscosity device at 25 and 100 cP. Fill volume = 3 mL. The patch injector is in thermal equilibrium with the patient’s skin and limited temperature variations are expected. However, should it be necessary, an add-on could be used to limit the variability of the flow rate in case of a large ambient temperature change which may modify the vapour pressure of the propellant and the fluid viscosity. A flow-control valve developed by Debiotech can be placed into the fluidic path to prevent any change of flow rate related to pressure condition changes, including the propellant reservoir or external conditions, for example altitude. One for very low flow rates (down to 1 mL/day or less). This add-on is particularly useful for long-term infusion, to control the infusion duration better, and for the infusion of a drug requiring especially careful control of the flow rate, such as insulin or morphine. The latest functional test results showed that Debiotech’s design for a disposable wearable bolus injector is able to inject a large volume of viscous medication, up to 100 cP, at a minimum flow rate of 0.5 mL/min. 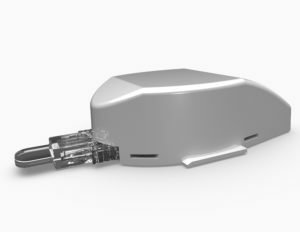 Future designs will include a dedicated compartment for optional high-end features that are already implemented in the JewelPUMP insulin micropump patch developed by Debiotech. Human factors studies are also planned in order to refine the actuator position and the indicator visibility. 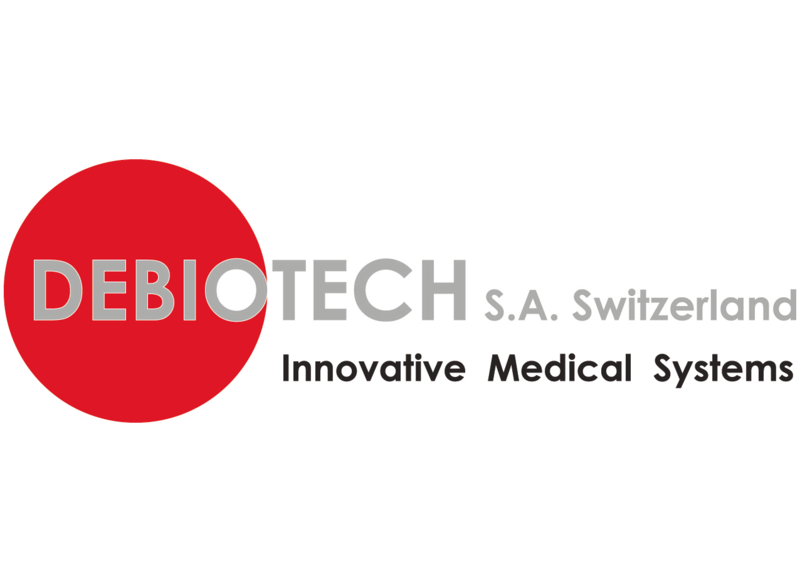 In summary, Debiotech intends to drive collaboration with key partners, including pharmaceutical companies, to customise this new platform to their needs for a subcutaneous delivery system dedicated to large volumes and/or viscous fluids. 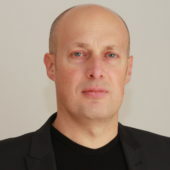 Jansen P, “2014 to 2018: an Update on the State of Wearable Injectors”. ONdrugDelivery Magazine, Issue 90 (Sep 2018), pp 6–8. “Modern Pharmaceutics, Fourth Edition (Drugs and the Pharmaceutical Sciences)” (Banker GS, Rhodes CT, eds). CRC Press, 2002. Zhang Q, Fassihi MA, Fassihi R, “Delivery Considerations of Highly Viscous Polymeric Fluids Mimicking Concentrated Biopharmaceuticals: Assessment of Injectability via Measurement of Total Work Done “WT””. AAPS PharmSciTech, 2018, Vol 19(4), pp 1520–1528. 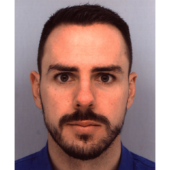 Wynne CJ et al, “Comparative pharmacokinetics of subcutaneous trastuzumab administered via handheld syringe or proprietary single-use injection device in healthy males”. Cancer Chemother Pharmacol, 2013, Vol 72(5), pp 1079–1087. Dumont-Fillon D et al, “Insulin Micropump with Embedded Pressure Sensors for Failure Detection and Delivery of Accurate Monitoring”. Micromachines, 2014, Vol 5(4), pp 1161–1172. Heinemann L, Krinelke L,“ Insulin Infusion Set: The Achilles Heel of Continuous Subcutaneous Insulin Infusion”. J Diabetes Sci Technol, 2012, Vol 6(4), pp 954–964. L Cornaggia et al, “Passive flow control valve for protein delivery”. Cogent Eng, 2017, Vol 4(1), epub.